When people come together with a common purpose and contribute their individual talents a lot of good things can happen. That was the experience of nearly 200 Wells Fargo employees as they joined together for a Build-A-Bike Team Building Event in the San Francisco Bay Area (Concord,California). The event was very active and solicited each individual to make contributions to the team effort. 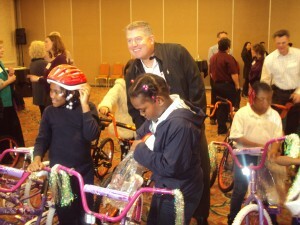 The final analysis was 34 bikes were given to a local boys and girls club, each participant was able to contribute to the effort and teamwork was defined as when common purpose collides with individual contributions. It was a fast-paced, fun learning experience that benefited the individual participants as well as the boys and girls clubs and the over 30 recipients of brand new bicycles. The Wells Fargo employees were separated into 32 groups and each group had activities to participate in. Completion of the activities was only possible by each member making significant contributions to the different projects. For each activity there was a common purpose, whether it was tasks to accomplish or problems to solve, the goal was clear so that each group knew what had to be achieved. The common purpose also highlighted individual contributions. Good team work isn’t when individuality is lost, but rather when each individual is able to contribute their best for the good to the team. The common purpose is the goal of the team work. That common purpose must collide with the individual efforts and contributions of the team members. Through the activities each person was able to contribute according to their own talents, skills and abilities. Whether a person is artistic, organizational, mechanical, analytical, motivational, etc., whatever is possessed by the individual they were able to contribute to achieving the common purpose. Through the Build-A-Bike Team Building Event every individual was given opportunity to contribute to the overall goal of the program. That was team work at its best. Thanks so much to Wells Fargo for a great team building experience and for giving back to the community in a very significant way. For details about Team Building in San Francisco, California, click here.